In every classroom that my children have been a part of, at least through the 3rd grade, they use the same disciplinary system. It involves color coded cards, displayed prominently on the whiteboard. Some of their teachers have had separate color cards for every kid in the classroom, and some have had separate color areas that each kid’s name gets moved to throughout the day. Every kid starts out every morning on green which is synonymous with good behavior. Most of the teachers have allowed several warnings and behavior reminders while the kids still stay on green. Yellow usually is for continued non-compliance or physically hurting someone, and in some classrooms, this involves a time-out of some kind. Red is for the very serious infractions, and blue sends them straight to the office. If you have to move your card or your name, it is visible to everyone in the classroom. I don’t know that I thought much about this system until this year. My oldest two kids aren’t the get-in-trouble-at-school types, and they would sooner die than have their names moved or their colors changed. This year is a bit different. Now I’m parenting a child who isn’t as confident. He’s not a trouble-maker, but he does have trouble regulating if put into a situation where there is little adult supervision and lots of potentially invasive kid-on-kid interactions. I’ve never seen him initiate any sort of aggression (apart from with his older siblings), but his moral compass swings hard towards justice. If someone hits him, he is unlikely to take it for very long without retaliation. And if something happens in the course of what he deems a competitive sport of some type, he is not likely to feel like he has done anything wrong at all. It’s just the game, you know? As a result, there’s been some days when his agenda doesn’t come home colored green. I know it immediately when he gets off the bus. He wears his shame like a heavy coat. Shoulders slumped, face downcast. He doesn’t make eye contact; he doesn’t use appropriate vocal tones when he speaks with me. After awhile, when he feels the safety of home kick in, he’ll share. And he cries. Which may not seem significant to anyone but us, but this is a kid who doesn’t cry from vulnerability. Ever. He cries from anger and frustration, but expressing vulnerable emotions is not in his wheelhouse. From the moment he moved in, he has fought any notion of vulnerability that we’ve attempted to extract from him or introduce to him. When we look at that discipline board, we may see 20 kids who stayed on green for that day and 5 who had some behaviors, so they’re on yellow. When my son looks at that same board, he sees 20 good kids and 5 bad kids. It’s how he describes it to us every day. Exactly how many kids are good kids. Exactly how many kids are sort of bad. Exactly how many kids are really bad. And when his card isn’t registering green? He doesn’t think, “I did something bad today.” He thinks, “I am bad.” He internalizes that shame like nothing I’ve ever seen. So much so that his tears this last time resulted in a final fearful vulnerable moment where he shared that he was just so afraid that he would have to go back to live at his previous abusive home. Because of a COLOR-CODED CARD. I respect teachers’ rights to have a disciplinary system. This one seems to be particularly motivating for my son, so I imagine the whole system seems to be really working. He yearns to stay on green every day. Just not for the right reasons. Our objectives should be to elicit right choices from the kids, yes, but not at the expense of their self-esteem and emotional health. I feel really strongly about the negative aspects of shame in our society, in our families, in our churches, but I don’t have answers on how to eradicate it. I think shame is the most insidious of negative emotions, a lie from a pit of hell. Not the shame that allows us to feel when we’ve done something wrong – I would call that guilt anyway, but that deep, deep shame that tells us that at our most basic level, we are not worthy. It tells us we are bad people, and no one would love us if they saw who we really were. That’s the shame that destroys. Brave and honest research is being done on the topic (thanks in large part to Brené Brown), but we have a long way to go. I hesitated to share any part of this story because I typically don’t share things are quite so personal to him. I try to be more vague, less specific. I don’t want to betray him in any way, but I also think it’s something we need to be talking about. I think someday he will want to think that the things he struggled with are not in vain. That, while protecting his privacy as much as possible, we used pieces of his story to make a difference. Today, I’m left with more questions than answers. How do we raise our children to be free of shame? How do we structure our schools, our churches, our society differently to teach people to live in freedom and walk in grace? How do we balance the need for discipline with the need to protect and nurture children? One thing I do know – it starts at home. It starts with me. For right now, all I can do is continually combat the voices from other places that tell my son that he’s a bad kid. That he’s not good enough. That he’s not worthy. That’s he’s still just one wrong choice away from being sent back. At home, in our family, we can tell him he’s loved. When he proudly tells us he stayed on green, we can praise him with condition – always, always adding that we love him just as much no matter what color his card is on at school. Reassuring him that he will never, never have to leave our family. Continually pounding it into his little head that he is not a bad kid. He is good. He is good no matter how he behaves. He is worthy because he EXISTS not because he behaves in a certain way. I don’t have to look very far to see what happens when kids are raised in a shame-based culture and home. It’s not pretty. Grown adults fight these same voices, but the older we get, the longer those voices have had to worm their way into our very being. It’s my job right now, with this particular child, to work my very hardest to make sure that doesn’t happen to him. So when I hold him tight each day, I whisper those same things to him that we’ve whispered from the beginning, each time with a catch in my throat and a prayer in my heart that this time, maybe THIS time, it’ll stick. 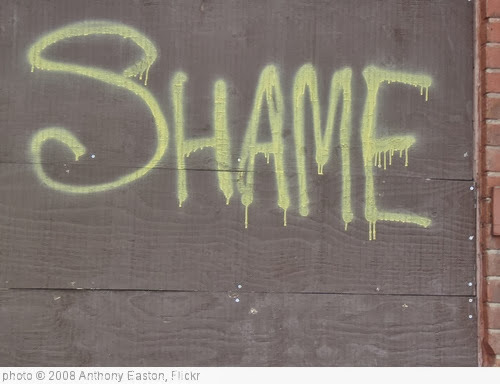 *this post has a couple of minor edits to include a more precise definition of the kind of shame I’m referring to, for clarity’s sake.